In Today’s video blog you can learn about the wonders of the three-stage Japanese light fitting, and find out how I coped when the phone rang. With little time to give over to blogging, I decided to do a video blog instead. Japan Podshow can be found at http://www.pokya.jp/japanpodshow. 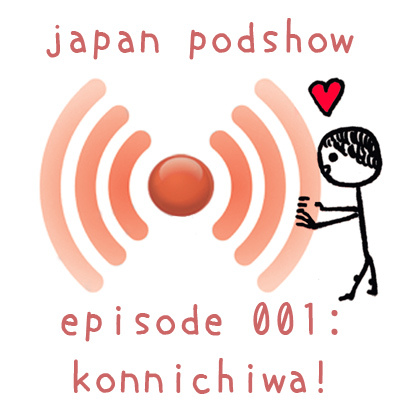 Japan Podshow Episode 1 now live! I’ve been wanting to restart podcasting ever since I stopped about two years ago, but due to the amount of effort that has to be put in, it’s always been pushed back to the ‘I don’t have time’ burner. It must have been a couple of months back that I decided that I did have time. I spent quite a few weeks just building the website, using the excuse that my co-host did not have time in order to not step outside of my comfort zone. I’ve enjoyed recording interviews, playing with technology, creating illustrations, rediscovering the myriad of musical loops within Garageband. I’m grateful for the opportunity the project has given me to start meeting people who I’ve long wanted to meet but have had no reason (excuse) to meet. I’m grateful for the friendships it’s helped create, I’m grateful for the feeling of accomplishment I now feel. I must admit, I’ve been pretty surprised by the range and scale of the side benefits of producing the podcast. Of course this is only the start – but not a bad start. There’s a lot of improvements that can be made in future episodes. As with everything in life it’s a learning process so the mistakes I made with this first one are welcome. I’m thinking of perhaps breaking it up, and releasing mid-week specials, about 10 minutes in length, focusing on one story at a time. I’m also hoping that the MacBook Pro, which should just be 3 days off now, will ease the tension I feel when editing – any work with video brings an instant beachball – very frustrating. I also had an idea tonight that I’d like to start video blogging in Japanese. I’m upset with myself for not maintaining my Japanese blog, but not upset enough to make me want to restart it. But video-blogging would be a lot easier, and good practice too – both in terms of language, and in disregarding the importance of the good opinion of others. I’m really happy here. One big reason is that I’m able to pursue my passions. Another is that I have a wife whom I dearly love and whom dearly loves me.